The Hampshire and Isle of Wight Air Ambulance Charity went fully operational on 1st July 2007. Every day the Air Ambulance crew provide an efficient, prompt response to road traffic collisions, sporting accidents, collapses, and many other incidents throughout Hampshire and the Isle of Wight. The Helicopter is called out many times per day, and these missions are often life saving. The Air Ambulance is solely funded by community, it receives no government funding. It currently costs the charity £125,000 each month to keep the Air Ambulance flying and they couldn’t do it without the constant support they receive from donations. Visit the HIOW Air ambulance website. Whether it is a few pence in a collecting box, or something more substantial, every penny counts and helps us in what we do. We hope you will consider supporting us and helping us Make a Difference in Bransgore. As an individual you can help us and support what we do. You may wish to consider joining us as a volunteer responder, or simply make a donation towards the work of CFR's. For more information on volunteering please visit the volunteering page. Businesses and shops may care to consider sponsoring a piece of equipment, or simply making a donation towards our work. Being associated with our group will enhance the reputation of any company, and there are tax advantages in doing so. (Please speak with your accountant or visit the website of HM Revenue & Customs for more information.) We acknowledge all significant support given on our website and printed "supporters" posters unless requested otherwise. Donations towards our work are always appreciated. All money received goes towards the cost of replacing the items used in the care of patients, training or other necessary items. If we collect for something specific - such as our response car - we will always make that clear at the point of collection. You can make a donation by simply placing money in the collecting boxes we currently have at Moorland News & Wine, Bransgore Country Market (Butchers) in Ringwood Road, The Three Tuns Public House in Ringwood Road, Bransgore, or The Coffee House In Betsy Lane. Alternatively you can make a donation by writing a cheque, made payable to South Central Ambulance Charitable Trust (who manage our account for us), and sending it to the address given on our Contact Us page, or by giving our co-ordinator Mike Jukes a call on 0844 500 9699. We do ask those making donations to consider 'Gift Aiding' their donation. This costs the donor nothing but enables us to claim back the basic rate of tax paid on the money donated. This increases the value of the donations by £2.80p for every £10 we receive. 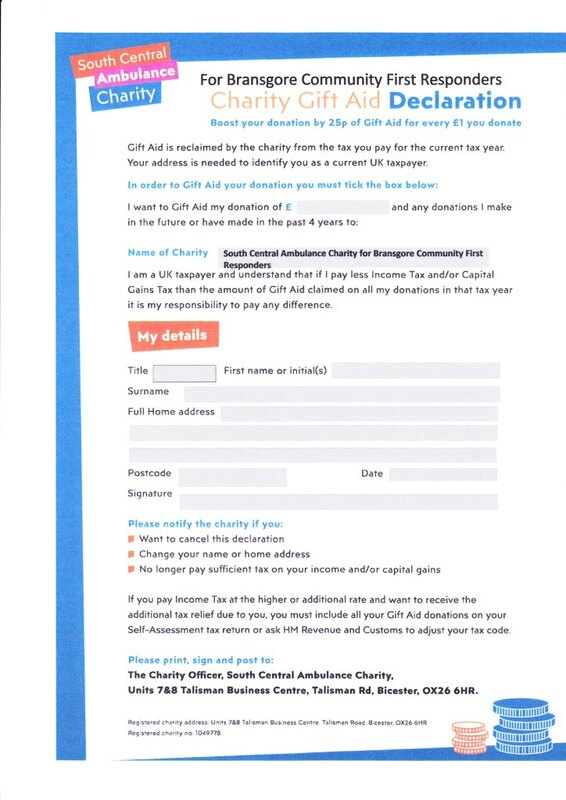 You can download our Gift Aid form here and send it with your donation. Or ask us when you see us at our street collections and we will provide you with a copy of the form. It only takes seconds to complete it but makes a VERY big difference. Thank You. Your donations will go into the CHARITY fund for the benefit of schemes in the area and enable us to remain one of the most effective CFR schemes in the South Central area. We have also set up a Just Giving page so that donations with Gift Aid can also be made online. We welcome suitable corporate businesses sponsorship, or any less formal support offered, from businesses, shops and individuals. Many companies already see the advantages of being linked in some way to a group such as ours, it enhances the company reputation and the degree of respect the local community have for them. Many have already indicated their support for what we do, both by sponsorship or one-off donations. Some arrange to print some of our publicity material, and we acknowledge their support, on that material, by the inclusion of their logo/branding and contact details. Whatever is done, it helps us to provide the service to the residents, visitors and businesses in and around Bransgore. Many, in turn, remember the name of those businesses and make use of them when the need arises. Interested? Please contact our co-ordinator for more information.